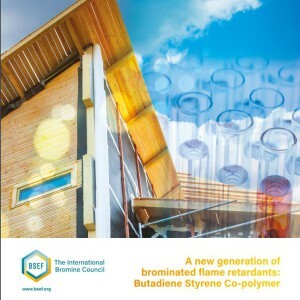 BSEF – The International Bromine Council, notes the recent coverage by Environmental Health News relating to a scientific publication concerning a polymeric brominated flame retardant (Butadiene Styrene Co-polymer) by Koch et al. entitled “Degradation of the Polymeric Brominated Flame Retardant “Polymeric FR” by Heat and UV Exposure” in the journal Environmental Science and Technology. BSEF notes that the study does not consider the conditions that are relevant to the use of the polymeric FR in the application itself. The polymeric flame retardant technology has been developed to provide effective flame retardant performance in polystyrene foams such as Expanded Polystyrene (EPS) and Extruded Polystyrene (XPS). The study took a pure “polymeric FR” and subjected it to a series of degradation experiments (by heat and UV exposure). The study then looked for indications of degradation via some indicators (total bromine, total organic carbon) and also attempted to identify potential degradation products. Under the most realistic scenario – heat exposure – the authors found very little degradation. Of the 7 degradation products reported, only 1 was brominated. Under the UV exposure scenario 75 degradation products were reported. Only 8 of these 75 were found to be brominated. The study identified 3 of these products (5-bromosalicylic acid, 2,4,6-tribromo-3-hydroxybenzoic acid, and 3,5-dibromo-4-hydroxybenzoic acid). “None of the identified potential degradation products resemble PBDEs”, notes Dr Bradley. Dr Bradley further noted: “the study used pure “polymeric FR”, so it so was not incorporated in a polystyrene matrix as it would normally be”. This is not realistic and obviously increases its susceptibility for degradation”. The authors of the paper confirm that “the focus laid only on the degradation of pure “Polymeric FR”, which was not incorporated into EPS or XPS products, but solely exposed to heat, which might have an impact on the results observed”. Butadiene Styrene Co-polymer (“Polymeric FR”) is designed specifically to deliver improved EHS properties (non-PBT) and was developed over many years of careful research as replacement for HBCD. It has a superior sustainability profile compared to HBCD (EPA Report June 2014). “It represents an important and innovative step forward for the Industry in providing effective flame retardant performance in polystyrene foams such as Expanded Polystyrene (EPS) and Extruded Polystyrene (XPS)”, noted Dr Bradley.